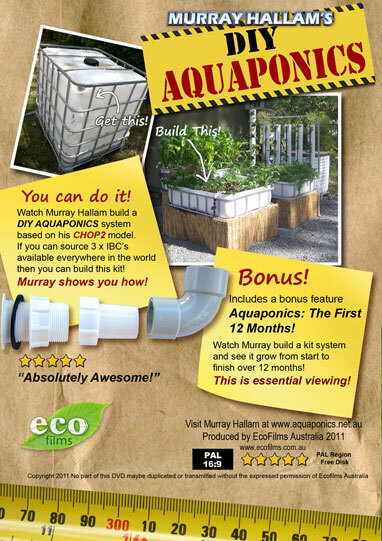 I have a great deal of admiration for Murray’s aquaponics videos. I have three of them. While I don’t use his sump system, I recognize that his example is what started me in aquaponics. This video was done in 2010. Murray uses tote tanks, or IBC’s to make grow beds. You can find totes that are food grade and usually for under $200. Murray explains CHOP2, his plans for a home system built out of totes. I don’t think Murray skipped anything in this video. He demonstrates cutting up the totes, putting them in place as well as hooking up the lines. More than anything, I appreciate the lengths Murray goes to show how to build the system. It’s one thing to have directions for building something, but it’s so much better to see it being built, to note when care is needed, even how to hold a tool. The CHOP2 system is simple and it avoids problem areas where a beginner in aquaponics might stumble. I recommend this video. It usually comes with a second DVD that I’ll discuss later. This entry was posted in Aquaponics by admin. Bookmark the permalink.